1st RO John George "Jack" Phillips, 24, was born on 11 April 1888. He and his colleague Harold Sydney Bride were employed by the Marconi company as wireless operators. Jack Phillips died in the disaster. 2nd RO Harold Sydney Bride was born in 1890. He and his colleague John George "Jack" Phillips were employed by the Marconi company as wireless operators. The two men boarded the Titanic at Belfast. Harold Bride was rescued. In der Nacht am 14./15.4.1912 sank die TITANIC nach Kollision mit einem Eisberg auf der Jungfernfahrt nach New York. Als Position wurde 41°46' N, 50°14' W gefunkt. 00:15 a.m.~~La Provence receives Titanic's first distress signals. Mount Temple and Cape Race also both hear Titanica sending CQD and giving her position as 41.44 N.50.24 W. 00:25 a.m.~~Carpathia recieves Titanic's CQD call. "Come at once. We have struck a berg. It's a CQD OM." ('It's a distress situation, old man.') 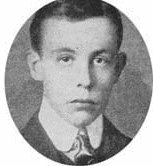 00:25 a.m.~~Forth Officer Boxhall comes in with Titanic's corrected position. Phillips resends it as 41.46 N. 50.14 W. 00:45 a.m.~~First use of SOS by Titanic while calling sister ship Olympic, en route to England 500 miles away. 1:27 a.m.~~Titanic says "we are putting the women off in the boats." 1:35 a.m.~~Baltic hears Titanic say "Engine room getting flooded." 1:45 a.m.~~Last signals heard from Titanic by Carpathia. "Engine-room full up to boilers." 1:55 a.m.~~Cape Race says to Virginian "we have not heard Titanic for about half an hour. His power may be gone." 2:10 a.m.~~Virginian hears 2 v's signalled faintly similar to Titanic's probably adjusting spark. (Phillips' was adjusting his transmitter to compensate for the dying power supply from the engine room.) 2:17 a.m.~~Loss of all power to the radio room--Titanic's distress signals end abruptly. Phillips says to Bride "Come, let's clear out" so they climb to the roof of the officers' quarters and assist in launching Collapsible B. 2:35 a.m.~~Carpathia calling Titanic. "If you are there, we are firing rockets." 6:45 a.m.~~Carpathia reports having rescued 20 lifeboats. 8:40 a.m.~~Carpathia calls CQ and says, "No need to stand by. Advise my captain, who has been cruising round the icefield with no result. Ship reversed. 9:00 a.m.~~Carpathia sends to Virginia: "We are leaving here with all on board about 800 passengers. Please return to your northern course."